A .com price freeze through 2024 more likely? More likely, but not guaranteed. When ICANN published its proposed contract extension with Verisign for the .com contract, it didn’t discuss the question of pricing. .Com prices are currently capped at $7.85 wholesale. The extension, from 2018 to 2024, didn’t touch the pricing element. But the understanding was that Verisign and the U.S. government, which has a cooperative agreement with Verisign for .com, would address this when the cooperative agreement expired in 2018. But Phil Corwin (new podcast) of the Internet Commerce Association reports that ICANN’s board ultimately added a clause extending the price freeze to 2024. This is proof that commenting in the ICANN process works; this would not have happened if domain name investors had not raised the issue. That said, the price freeze is only frozen until it isn’t. Verisign and the U.S. government will certainly revisit the issue when the cooperative agreement comes up for renewal in two years. The government has the capability to force renewal of the agreement, but anytime there’s a discussion, there’s a chance for change. For example, if the two parties agree to allow Verisign to increase prices nominally in return for some other provision, then ICANN and Verisign would be forced to adjust its contract. 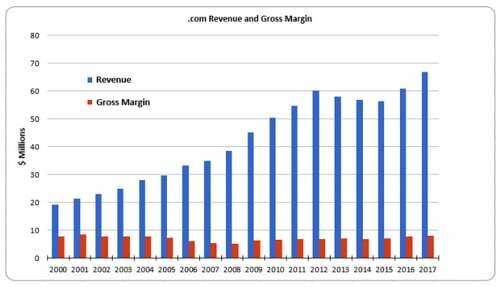 Could the price of .com domain names skyrocket in a couple years? Here’s what all of the discussion is about. ICANN is extending Verisign’s contract to run .com from 2018 to 2024. Even though the contract doesn’t expire for another couple of years, the extension is being granted to tie the dates of the .com extension to the new root zone maintainer agreement between ICANN and Verisign. The root zone agreement was previously part of the Cooperate Agreement between Verisign and the National Telecommunications and Information Administration (NTIA). It is being shifted to a contract directly with ICANN as part of the transition of IANA functions (commonly referred to as “The U.S. giving up the internet”). The .com contract extension extends the existing contract, which freezes domain prices at $7.85. But it’s a bit more complicated than that. My understanding is that pricing is really controlled by the Cooperative Agreement, so it’s possible Verisign and the NTIA can negotiate new prices in 2018, when Verisign would have certainly asked for an increase. The bigger concern put forth by some in the community, and the reason for the Domaining.com headlines, is this: Does Verisign really need to keep any sort of Cooperative Agreement with the U.S. government? Could they just nix it and set their own prices in the future? I asked the NTIA about its role in pricing back in June, and it said that the transition of the root zone contract doesn’t affect the NTIA’s role in the rest of the relationship, i.e. pricing. I reached out again for clarification a couple of days ago and have not yet heard back. But…it’s all a bit confusing, and some ICANN policy wonks I’ve spoken to don’t have a clear answer about how the U.S. government can control wholesale .com pricing in the future. The answer may lie in the lawsuit settlement between ICANN and Verisign, which dates back to Verisign’s SiteFinder service. The settlement set forth Verisign’s perpetual contract for .com. There’s also the anti-trust element to Verisign’s monopoly on .com. The wholesale price of .com domain names is critical to many domainers’ businesses, so this is certainly an issue domainers should understand. Unfortunately, I can’t give you a cut-and-dried answer today. So it’s probably worth commenting today about the contract renewal to make sure that someone gets to control wholesale .com pricing.